We have been playing games since the 80's. It was always annoying that the counter trays were so shallow, so we fixed that problem. We ordered a new mold made for our "Deep Dish" counter trays. A normal counter tray is about 3/8" deep. Our Deep Dish counter trays are 7/8" deep. This means you can get more counters into every pocket -AND- most importantly, you can put dice in the pockets without bulging the lid outward. Overall, the trays are 8.5" wide by 11" long. So they comfortably fit into our standard size game boxes. You get a set of 5 Deep Dish counter trays. Each counter tray has a clear plastic lid and a black plastic tray. The DVG logo is imprinted into the bottom of each pocket. 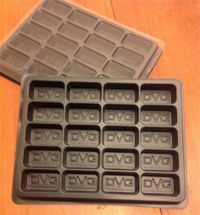 This makes them perfect for holding all your DVG counters!